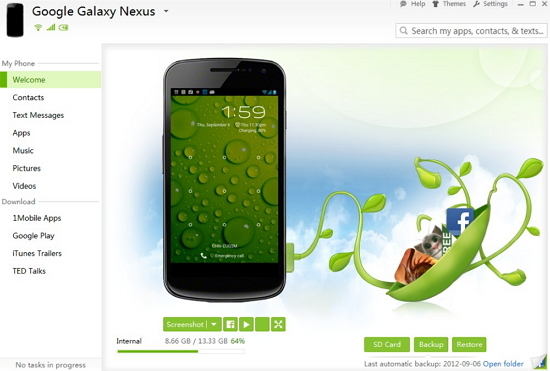 SnaPea is a freeware to manage your Android device from PC. SnapPea is the solution for users who want all of their stuff in one place. It gives you instant access to your apps, music, pics, and texts from your Windows desktop. Transfer files, share pics, or text message from the comfort of your computer. Download thousands of apps for your Android from 1mobile apps and Google Play. So dont waste your mobile data plan to download apps. Send text messages from a full-size keyboard from PC, without touching your phone. நன்றி ! மிகவும் உபயோகமான அப்ளிகேசன் !